Growing up in an Italian-American family, Spaghetti & Meatballs was a staple in our household. Long before the days that I had discovered my gluten allergy, it was probably one of my favorite meals. But let’s be honest, what’s not to love? It’s filling and comforting – the perfect example of comfort food. When I started keto, I felt like I had found a substitute for almost everything I could possibly need. The one exception was pasta. I know that the tofu shirataki noodles get RAVE reviews in the weight/low carb/nutrition community. But meh. They’re not for me. Even after I got the “fishy” smell off of them, the texture and the difficulty breaking them down in my mouth was just too much for me. Enter…spaghetti squash! I’ve never actually had spaghetti squash until tonight and I’m so glad I finally decided to try it. It’s amazing. While the carb count isn’t super low (8 net carbs/cup), the satiety, comfort and taste are worth spending the extra carbs on! But enough about spaghetti squash, the real star here are my meatballs. They’re herby and juicy and full of flavor. Definite qualities I look for in a good meatball! Traditionally, Italian meatballs are made with breadcrumbs or bread soaked in milk. Being on a keto diet, these things just aren’t an option. By using a mixture of grated parmesan cheese and low-sugar ketchup, a great texture is formed! 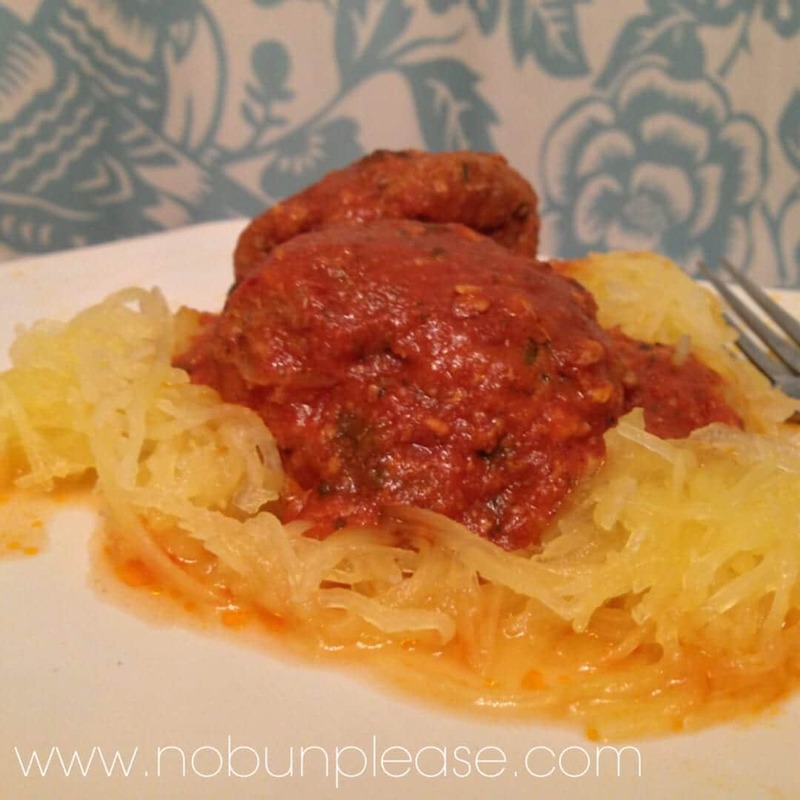 If you want to serve these over spaghetti squash, you can easily do this in the microwave. Check out this video to see how easy and versatile it is! So there you have it, keto spaghetti & meatballs!. Another comfort food to cross off the list! Wow your friends and family with this traditional & keto friendly meal! Macro/Nutrition: For 2 meatballs, this come out to roughly 210 calories, 2 carbs, 2 NET carbs, 12 grams of fat, 0 grams of fiber and 16 grams of protein per serving! If you serve these over 1 cup cooked spaghetti squash, add 50 calories, 8 NET carbs, 10 carbs, 2 grams of fiber. Combined all ingredients in a mixing bowl and mix until all spices and herbs and evenly distributed. Roll mixture into lime size balls. You should be able to get around 20 meatballs. Place them on a cookie sheet lined with foil and baked until golden and cooked through. It took around 25-30 minutes for me. Remove from oven and simmer on stove top in marinara sauce until sauce is heated through. Eat like this or serve with your favorite pasta substitute (shirataki, spaghetti squash).